Plush toys in a bird species from the well-known computer game of Angry Birds are used for protest submission during fights in the European championship by the Olympic types of the wrestling, passing in Vantaa (Finland). Details of WRESTRUS.RU were reported by the principal of the FILA working group "Wrestling-2020" Georgy Bryusov. On April 5 in the Greco-Roman wrestling European championship, passing in Vantaa (Finland), Adam Kurak won gold in weight category to 66 kg. The award to the Russian wrestler was handed over by the member of the IOC from Finland Peter Talberg. Details were reported by the principal of the FILA working group"Wrestling-2020" Georgy Bryusov. In Karaganda will pass a stage tournament "Kazakhstan barysy"
The third year in a row passes republican tournament in our country on national wrestling "Kazak kuresi" on a prize of the President of the Republic of Kazakhstan N. A. Nazarbayev ""Kazakhstan barysy"". The champion of Europe on free-style Gadzhi Aliyev wrestling(65 kg) in interview of azerisport.com told about the victory and the future. In the free-style wrestling European championship, passing in Vantaa (Finland), the debutant of Russian national team Rustam Ampar took the fifth place in category to 57 kg. In a semi-final it in the most persistent fight conceded to the silver prize-winner of London-2012 Vladimir Hinchegashvili - 4:6, and in fight for the third place to Frenchman Zokheyr Al Orraku - 3:3 (a victory on the last action). Russian Abdusalam Gadisov justified hopes of experts and fans, with noticeable advantage having won the European championship final in Finland (weight category to 97 kilograms) titled Azerbaijanian Hetaga Gazyumov, the head coach of the national team of Dagestan on free-style wrestling, the bronze prize-winner of the Olympic Games-2004, the double world champion Sazhid Sazhidov declared to R-Sport agency. 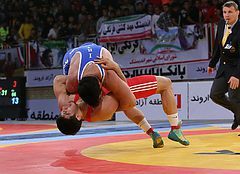 In the free-style wrestling European championship, passing in Vantaa (Finland), the world champion-2013 Bekhan Goygereev became the silver prize-winner in category to 61 kg. In the final he lost to Azerbaijanian Hasan Aliyev. The defeat reasons Bekhan Goygereev called wRESTRUS.RU. On April 2 in the European championship in Finnish Vantaa the second gold medal for Russian women's national team was won by Maria Gurova. She with the score 5-2 won against Maria Prevolaraki a final duel from Greece. It should be noted that both gold brought to our team of the sportswoman from Egoryevsk. In the European championship Maria Gurova told about the first victory to the correspondent of WRESTRUS.RU Asiye Alimovoy. In the European championship passing in Finnish Vantaa on the Olympic styles of wrestling Russian women's national team won two gold medals. Both awards of the highest advantage in a moneybox of team brought pupils of the trainer Oleg Chernov and Egoryevsky school of wrestling. Oleg Chernov shared Asiy Alimovy pleasure with the correspondent of WRESTRUS.RU, and also told about the interesting moments from life of the wards.